In 1984 I received a grant to study in Thailand. At that time the Canada Council for the Arts only funded study trips to Paris for classical musicians, so my request for funding to study in Thailand was refused. However, I was persistent and when on a cross-Canada tour, I stopped in at the offices to talk to the officer again. Once she saw the poster for my concert with a picture of the khaen, the instrument I wanted to study, she became interested in the instrument and project. As such I received the first Project grant given to a Canadian artist to study overseas in a non-classical genre, and opened the flood gates for Canadian artists to study around the world. I stretched the $2000 I received to last a full six months in Asia. I had arranged to study at Srinakharinwirot University in Mahasarakham, in the north east of Thailand. , who had recently returned to Thailand after finishing grad school at the University of Washington, assisted me. 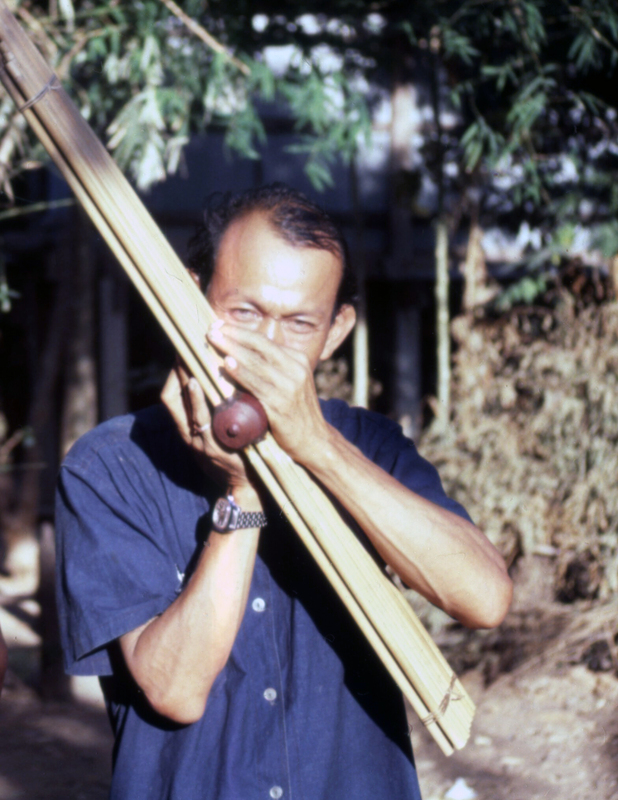 I was there to study the khaen, a 16-reed bamboo mouth organ native to the region and that of Laos. I quickly found that I was following in the footsteps of Dr. Terry Miller who had recently been in the area a year or so before, researching his doctoral dissertation. My work was not academic, but just out of self-interest in the instrument and music. Parts of the northeast had not seen that many white people yet, and in some villages kids threw rocks at me, thinking I was a white ghost coming to eat them (a popular story parents told their children so they would behave). Jarenchai had arranged for me to study with three top performers as teachers, one from each generation, but upon my arrival the oldest teacher was too ill, so I worked primarily with Nukan Srichrangthin and later with Sombat Sinla, the youngest. My lessons with Nukan were intense; I studied 7 hours a day with him six days a week. Then I practiced four hours a night to make sure I was ready for the next lesson. I didn’t speak Thai and he didn’t speak English, so the first few lessons we had a translator. The translator said he couldn’t come for a few days and when he returned he was shocked, as I would ask Nukan a question in English and he would answer me in Thai seemingly understanding each other. That was the last day we used the translator. My way of learning was to imitate Nukan precisely, every movement of his body, breath, fingers, to try and be an exact mirror copy of him. At first it was a struggle to understand what was happening, but after awhile it started to flow. The greatest difficulty was that the music had an improvisatory element to it, so every time Nukan played a piece it was different. So I had to learn to understand the patterns and underlying structure of the music and this took a lot of time. One day Sombat Simla showed up and took over my lessons. He was quite young and totally blind. He only spoke about ten words of English. When we first sat down he played the instrument slowly note by note. I responded by playing the same thing very quickly. He laughed and said, “OK.” He then played a simple piece, which I played back again a bit faster with embellishments, he laughed again, saying ‘OK.” Then he played an amazingly fast and complicated piece, after which I sat in total silence, and he laughed again saying, “OK, OK, OK!” And our lessons began. The music that Sombat played was basically the same as Nukan’s, but included his own voicings and approaches. It was great to experience the contrast between the two performers. My host, Jarenchai, wanted to make use of my studying khaen to promote the instrument to Thai youth as much as he could so he arranged for me to give lectures at local universities, interviews and performances on local and national radio programs, and finally at the end of my stay he arranged for me to appear on National TV. I was to play khaen for a famous mawlum, a singer that the khaen usually accompanies. The mawlum sang in Lao and I would adjust my melody based on what she was going to sing. 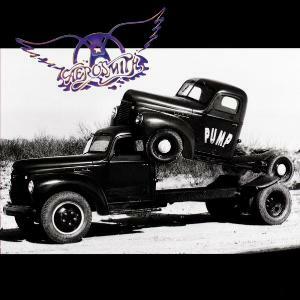 By the context of her lyrics I was to anticipate the tones of the words she was going to sing and then adjust my melody to match or at least not conflict with her tones and melodic line. As I had by this time only learned a small amount of Thai and didn’t speak Lao at all, my teacher stood off camera indicating if my melody should rise or fall with hand signals. The TV audience saw this white guy easily accompany an amazing singer, while in reality I had no clue as to what was coming next. I was technically good, but still was not inside the culture enough to fulfill the traditional function. After studying khaen I went to Chiang Mai in Northern Thailand and undertook a short study of the naw, a 5-pipe bamboo mouth organ with a gourd resonator played by the Lahu and Lisu people. My lessons took place in a large building in a small village on the outskirts of town. I would sit down with my teacher while the women of the village would all come, set up their weaving and watch. It was quite a strange experience to have an audience for my lessons and it certainly added a new element of pressure. Most of the time they laughed at my mistakes and attempts to get the music, but once I got a piece they all applauded. While there I wrote a new piece for the instrument and taught it to my teacher. When I returned for the next lesson, he told me he had played my piece at a tourist event, expressing that the dumb tourists didn’t even know a Canadian piece when they heard one! Unfortunately, at the time I was there, Thailand did not recognize the cultural treasures that they had in traditional village musicians. To be able to spend hours a day listening to each of these stunning performers play was amazing, and to be able to study with them was a huge honour. I often would wonder why I was the only person sitting there listening to this amazing master play, when people just outside the door would be listening to garbage music on the radio. Nukan survived as a rice farmer, but was a superb performer. Although I was a poor musician in the west, I was rich compared to him, and never balked at giving him as much money for lessons as I could. Nukan, passed away a number of years ago, and I owe him a big thank you for all the time he spent with me. 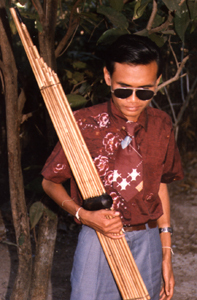 Sombat was an itinerant musician, traveling throughout the region, living off what people gave him to perform. He is still active and is now considered the top khaen player in Thailand. Fortunately there have been a small number of other folks that have gone to Thailand to study khaen and some have done much better at integrating into the culture than I did. My hat is off to them. The khaen became one of my main instruments, which I recorded with artists ranging from Pauline Oliveros to Aerosmith (I played the naw with Aerosmith as well). I often used to play for the Thai community in Vancouver at their special events, and it was always a treat when those from northeast Thailand got up and started dancing. I went back to Thailand a number of times to continue my studies and visit my teachers. Dr. Jarenchai Chonpairot is the champion of these amazing northeast Thai performers, bringing foreign artists, researchers and the public to recognize their talents. He is still active in Thailand, and by some at least is recognized as a pivotal person for this music.